Zhao Ziyang (pronounced [ʈʂâu̯ tsɹ̩̀i̯ǎŋ]; 17 October 1919 – 17 January 2005) was a high-ranking politician in China. He was the third Premier of the People's Republic of China from 1980 to 1987, Vice Chairman of the Communist Party of China from 1981 to 1982 and General Secretary of the Communist Party of China from 1987 to 1989. As a senior government official, Zhao was critical of Maoist policies and instrumental in implementing free-market reforms, first in Sichuan, subsequently nationwide. He emerged on the national scene due to support from Deng Xiaoping after the Cultural Revolution. He also sought measures to streamline China's bureaucracy and fight corruption, issues that challenged the Party's legitimacy in the 1980s. Zhao Ziyang was also an advocate of the privatization of state-owned enterprises, the separation of the Party and the state, and general market economic reforms. Many of these views were shared by then-general secretary Hu Yaobang. His economic reform policies and sympathies to student demonstrators during the Tiananmen Square protests of 1989 placed him at odds with some members of the party leadership, including Premier Li Peng, former President Li Xiannian and Party elder Chen Yun. Zhao also began to lose favour with paramount leader Deng Xiaoping. In the aftermath of the events, Zhao was purged politically and effectively placed under house arrest for the next 15 years. In 2005, he died from a stroke in Beijing. Because of his political fall from grace, he was not given the funeral rites generally accorded to senior Chinese officials. His unofficial autobiography was published in English and in Chinese in 2009, but the details of his life remain censored inside mainland China. Unlike many Party members active in the 1930s and 1940s who later became senior Chinese leaders, Zhao joined the Party too late to have participated in the Long March of 1934–1935. He served in the People's Liberation Army during the Second Sino-Japanese War and the subsequent civil war, but his posts were largely administrative. Zhao's career was not especially notable before he emerged as a Party leader in Guangdong in the early 1950s. Zhao rose to prominence in Guangdong from 1951, initially following a ruthless ultra-leftist, Tao Zhu, who was notable for his heavy-handed efforts to force local peasants into living and working in "People's Communes". When Mao Zedong's Great Leap Forward (1958–1961) created an artificial famine, Mao publicly blamed the nation's food shortages on the greed of rich peasants, who were supposedly hiding China's huge surplus production from the government. Zhao's faith in Mao led him to take a leading role in a local campaign aimed at torturing peasants into revealing their imaginary food supplies. Through supporting the Great Leap Forward, Zhao was partially responsible for the millions of people who died from starvation and malnutrition in Guangdong between 1958 and 1961. Zhao's experiences during the Great Leap Forward led him to support moderate political and economic policies, including those supported by Deng Xiaoping and President Liu Shaoqi. He led efforts to re-introduce limited amounts of private agriculture and commerce, and dismantled the People's Communes. Zhao's methods of returning private plots to farmers and assigning production contracts to individual households were replicated in other parts of China, helping the country's agricultural sector recover. After achieving senior positions in Guangdong, Zhao directed a harsh purge of cadres accused of corruption or having ties to the Kuomintang. Zhao spent four years as a fitter in Hunan, at the Xianzhong Mechanics Factory. Zhao Wujun, the youngest of his four sons, worked with him (Zhao also had a younger daughter). While in political exile, Zhao's family lived in a small apartment close to his factory, with a small suitcase in the living room that served as a dinner table. Zhao's rehabilitation began in April 1971, when he and his family were woken in the middle of the night by someone banging on the door. Without much explanation, the Party chief of the factory that Zhao was working at informed Zhao that he was to go at once to Changsha, the provincial capital. The factory's only means of transport was a three-wheeled motorcycle, which was ready to take him. Zhao was driven to Changsha's airport, where a plane had been prepared to fly him to Beijing. Still unaware of what was happening, Zhao boarded the plane. He was checked into the comfortable Beijing Hotel, but wasn't able to get to sleep: he later claimed that, after years of living in poverty, the mattress was too soft. In the morning, Zhao was taken to a meeting with Premier Zhou Enlai at the Great Hall of the People. Soon after they met, Zhao began a speech that he had prepared over the previous night: "I have been rethinking the Cultural Revolution during these years as a labourer..." Zhou cut him off, saying "You've been called to Beijing because the Central Committee has decided to name you as a deputy Party chief of Inner Mongolia." After being recalled from political exile, Zhao attempted to portray himself as a born-again Maoist, and publicly renounced any interest in encouraging private enterprise or material incentive. Zhao's late conversion to Maoism did not last long, and he later became a "principal architect" of the sweeping, pro-market changes that followed the death of Mao. Despite his important role in guiding the economy of China over the course of his career, Zhao had no formal training in economics. Throughout 1972 Zhou Enlai directed Zhao's political rehabilitation. Zhao was appointed to the Central Committee, and in Inner Mongolia became the Revolutionary Committee Secretary and vice-chairman in March 1972. Zhao was elevated to the 10th Central Committee in August 1973, and returned to Guangdong as 1st CPC Secretary and Revolutionary Committee Chair in April 1974. He became Political Commissar of the Chengdu Military Region in December 1975. 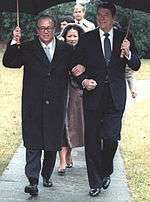 President Reagan walking with Zhao during his visit to the White House on January 10, 1984. After ousting Hua Guofeng as China's "paramount leader" in 1978, Deng Xiaoping recognized the "Sichuan Experience" as a model for Chinese economic reform. Deng promoted Zhao to a position as an alternate member of the Politburo of the Communist Party of China in 1977, and as a full member in 1979. 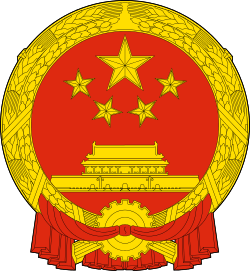 He joined the Politburo Standing Committee, China's highest ruling organ, in 1980. Zhao became the Leader of the Leading Group for Financial and Economic Affairs and Vice Chairman of the Communist Party of China in 1980 and 1981 separately. After 1978 Zhao's policies were replicated in Anhui, with similar success. In 1980, after serving under Hua Guofeng as vice-premier for six months, Zhao replaced Hua as Premier of the State Council with a mandate to introduce his rural reforms across China. Between 1980 and 1984, China's agricultural production rose by 50%. 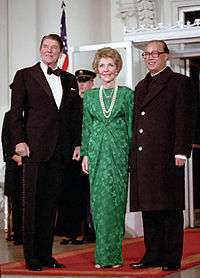 Zhao was hosted by US president Ronald Reagan at the White House on January 10, 1984 as part of a broader effort to improve China's relations with the West. Zhao developed "preliminary stage theory", a model for transforming the socialist system via gradual economic reform. As premier, Zhao implemented many of the policies that were successful in Sichuan at a national scale, increasingly de-centralizing industrial and agricultural production. Zhao successfully sought to establish a series of special economic zones in coastal provinces in order to attract foreign investment and create export hubs. Zhao's reforms led to a rapid increases in both agricultural and light-industrial production throughout the 1980s, but his economic reforms were criticized for causing inflation. Zhao promoted an open foreign policy, improving China's relations with Western nations in order to support China's economic development. In the 1980s, Zhao was branded by conservatives as a revisionist of Marxism, but his advocacy of government transparency and a national dialogue that included ordinary citizens in the policymaking process made him popular with many. Zhao was a solid believer in the Party, but he defined socialism very differently from Party conservatives. Zhao called political reform "the biggest test facing socialism." He believed economic progress was inextricably linked to democratization. Zhao was a fan of golf, and is credited with popularizing the game's reintroduction to the mainland in the 1980s. Zhao and Hu also began a large-scale anti-corruption programme, and permitted the investigations of the children of high-ranking Party elders, who had grown up protected by their parents' influence. Hu's investigation of Party officials belonging to this "Crown Prince Party" made Hu unpopular with many powerful Party officials. In January 1987 a clique of Party elders forced Hu to resign, on the grounds that he had been too lenient to student protestors. After Hu's dismissal, Deng promoted Zhao to replace Hu as CPC general secretary, putting Zhao in the position to succeed Deng as "paramount leader". One month before Zhao was appointed to the position of general secretary, Zhao was interviewed by an American reporter, stating: "I am not fit to be the general secretary... I am more fit to look after economic affairs." Zhao's vacated premiership was in turn filled by Li Peng, a conservative who opposed many of Zhao's economic and political reforms. In the 1987 Communist Party Congress Zhao declared that China was in "a primary stage of socialism" that could last 100 years. Under this premise, Zhao believed that China needed to experiment with a variety of economic reforms in order to stimulate production. Zhao proposed to separate the roles of the Party and state, a proposal that has since become taboo. Western observers generally view the year that Zhao served as general secretary as the most open in the history of the People's Republic of China. Many limitations on freedom of speech and freedom of press were relaxed, allowing intellectuals to freely express themselves, and to propose "improvements" for the country. Zhao boldly introduced the stock market in China and vigorously promoted futures trading there. In 1984, under the support of Zhao Ziyang, Beijing, Shanghai and Guangzhou became experimental cities of joint-stock system,some companies issued stock only within own company workers. In November 1985, the first share-issuing enterprise was established in Shanghai and issued 10,000 shares of 50 RMB par value stock publicly, attracted many investors' interest. Zhao Ziyang hosted a financial meeting on 2 August 1986, he demanded that the joint stock system should be carried out nationwide in the following year. Zhao's proposal in May 1988 to accelerate price reform led to widespread popular complaints about rampant inflation and gave opponents of rapid reform the opening to call for greater centralization of economic controls and stricter prohibitions against Western influence. This precipitated a political debate, which grew more heated through the winter of 1988 to 1989. Premier Zhao Ziyang of the People's Republic of China on a tour of the USS ARIZONA memorial on January 7, 1984. Because Zhao had risen to power through his work in the provinces, he never enjoyed strong connections among the Party leadership in Beijing. Because he had led the Communist Youth League in the 1950s, Zhao often relied on its former members for support, and Zhao's enemies accused him of promoting a "Communist Youth League faction" within the CCP. Among Beijing's Party elders, Chen Yun and Li Xiannian were notably critical of Zhao and his policies. Despite his criticism of Zhao, Chen Yun was the Party elder most respected by Zhao, and Zhao would frequently attempt to consult with Chen before implementing new policies. Li Xiannian resented Zhao personally for Zhao's interest in foreign culture, and for Zhao's willingness to learn from economic models that had been successful outside of China. According to Zhao, Li Xiannian "hated me because I was implementing Deng Xiaoping's reforms, but since it was difficult for him to openly oppose Deng, he made me the target of the opposition." Zhao wrote warmly of Hu Yaobang in his autobiography, and generally agreed with Hu on the direction of China's economic reforms. Although Deng Xiaoping was Zhao's only firm supporter among the Party elders, Deng's support was sufficient to protect Zhao throughout Zhao's career. As late as April 1989, one month before the dramatic end of Zhao's career, Deng assured Zhao that he had secured the support of Chen Yun and Li Xiannian for Zhao to serve two more full terms as Party general secretary. The second half of 1988 saw the increasing deterioration of Zhao's political support. Zhao found himself in multi-front turf battles with the Party elders, who grew increasingly dissatisfied with Zhao's hands-off approach to ideological matters. The conservative faction in the politburo, led by Premier Li Peng and Vice-premier Yao Yilin, were constantly at odds with Zhao in economic and fiscal policy making. Zhao was under growing pressure to combat runaway corruption by rank-and-file officials and their family members. In the beginning of 1989, it was evident that Zhao was faced with an increasingly difficult uphill battle, and he may have seen that he was fighting for his own political survival. If Zhao was unable to turn things around rapidly, a showdown with the Party conservatives would be all but inevitable. The student protests triggered by the sudden death of former CPC general secretary Hu Yaobang, widely admired as a reform-minded leader, created a crisis in which Zhao was forced into a confrontation with his political enemies. Zhao was general secretary for little more than a year before the death of Hu Yaobang on 15 April 1989, which, coupled with a growing sense of public outrage caused by high inflation, provided the backdrop for the large-scale protest of 1989 by students, intellectuals, and other parts of a disaffected urban population. The Tiananmen protests initially began as a spontaneous public mourning for Hu, but evolved into nationwide protests supporting political reform and demanding an end to Party corruption. Student demonstrators, taking advantage of the loosening political atmosphere, reacted to a variety of causes of discontent. The diverse demands of protesters included greater economic liberalization, political democracy, media freedom, freedom of speech and association, rule of law, and to have the legitimacy of the movement recognized. Some protest leaders spoke against official corruption and speculation, price stability, social security, and the democratic means to supervise the reform process. Ironically, some of the original invective was also directed against Zhao. Party hardliners increasingly came to the conclusion that the demonstrations were due to Zhao's rapid pace of reform, which they believed caused a sense of confusion and frustration among college students. The protesters may have been encouraged by the imminent collapse of other Communist governments in Eastern Europe. Zhao treated the protesters sympathetically. The protests may have died down, but on April 26 he was obliged (as the Party General Secretary) to leave for North Korea on a state visit. While he was away Premier Li Peng organized a meeting between Deng Xiaoping and the Standing Committee, in which Li and his allies convinced Deng that the protests were threatening to the Party. Following the meeting Li had the China Daily publish an article (which he attributed to Deng), which criticized the protests as "premeditated and organized turmoil with anti-Party and anti-socialist motives." Following the publication of Li's article the protests grew to over 10,000 and spread to cities across China, notably including Shanghai and Guangzhou. Li attempted to mollify the protesters by engaging in dialogue with student groups. He attempted to institute numerous government reforms, including the creation of a special commission to investigate government corruption; but, according to Zhao, the commission was ineffective because "Li Peng and others in his group actively attempted to block, delay and even sabotage the process." Zhao attempted to arrange a meeting with Deng in order to convince him to retract Li's "April 26 article". Zhao was granted a meeting with Deng on May 17; but, instead of the private meeting he expected, he found that the entire Standing Committee was present. When Zhao advocated modifying the editorial, President Yang Shangkun proposed declaring martial law according to the decision of National People's Congress. Zhao refused to order the military to crush the demonstrations. Deng eventually decided on declaring martial law. According to the Tiananmen Papers, the standing committee vote was split 2-2 with one abstention, and retired CCP veterans were called in to determine the vote. According to Zhao, there was no vote, and the decision to declare martial law was illegal according to the Party's rules. “ Students, we came too late. We are sorry. You talk about us, criticize us, it is all necessary. The reason that I came here is not to ask for your forgiveness. What I want to say is that you are all getting weak, it has been seven days since you went on a hunger strike, you can't continue like this. As time goes on, your body will be damaged beyond repair, it could be very life-threatening. Now the most important thing is to end this strike. I know, your hunger strike is to hope that the Party and the government will give you a satisfying answer. I feel that our communication is open. Some of these problems can only be solved through certain procedures. For example, you have mentioned about the nature of the incident, the question of responsibility; I feel that those problems can be resolved eventually, we can reach a mutual agreement in the end. However, you should also know that the situation is very complicated, it is going to be a long process. You can't continue the hunger strike longer than seven days, and still insist on receiving a satisfying answer before ending the hunger strike. You are still young, we are old, you must live healthy, and see the day when China accomplishes the four modernizations. You are not like us, we are already old, so we do not matter. It is not easy for this nation and your parents to support your college studies. Now you are all about 20, and about to sacrifice your lives so easily, students, couldn't you think rationally? Now the situation is very serious, you all know, the Party and the nation is very antsy, our society is very worried. Besides, Beijing is the capital, the situation is getting worse and worse everywhere, this cannot continue. Students, you all have good will, and are for the good of our nation, but if this situation continues, loses control, it will have serious consequences elsewhere. In conclusion, I have only one wish. If you stop hunger strike, the government won't close the door for dialogue, never! The questions that you have raised, we can continue to discuss. Although it is a little slow, but we are reaching some agreement on some problems. Today I just want to see the students, and express our feelings. I hope students could think about this issues calmly. This thing can not be sorted out clearly under illogical situations. You all have that strength, you are young after all. We were also young before, we protested, laid our bodies on the rail tracks, we never thought about what will happen in the future at that time. Finally, I beg the students once again, think about the future calmly. There are many things that can be solved. I hope that you will all end the hunger strike soon, thank you. After a bow, people began to applaud and some students burst into tears. That was Zhao's last public appearance, for Zhao had been ousted by party elders just before coming to the square (when Deng Xiaoping ordered troops, Zhao turned in his resignation). The phrase "我们已经老了，无所谓了" (Traditional Chinese: "我們已經老了，無所謂了") – "We are already old, we don't matter anymore" – became a famous quotation after that. The protesters did not disperse. A day after Zhao's 19 May visit to Tiananmen Square, Premier Li Peng publicly declared martial law, leading to the deaths of hundreds of protesters on June 4. In the power struggle that ensued, Zhao was stripped of all his positions and was put under house arrest. Following Zhao's dismissal, Jiang Zemin replaced Zhao as General Secretary of the Communist Party of China and successor of Deng Xiaoping. Over thirty ministers were dismissed as Zhao loyalists, and Zhao was widely criticized in the Chinese media. In the end, mentioning his name in the media was banned, while his photographs were airbrushed and he disappeared from textbooks. Zhao's rival, Li Peng, later accused Zhao of fomenting the Tiananmen Protests exclusively for political gain. According to Li, "Zhao liaised with Bao Tong immediately after his arrival in Beijing (from Pyongyang). Bao gathered some other of Zhao's supporters to hash out the situation. They feared that Zhao's political future was at stake: Zhao did not succeed in [managing] the economy, was not stellar politically, does not have a power base of his own, and his son was suspected of illegal business dealings. As such, it was likely that Zhao would become the 'scapegoat' of the student movement. These advisors suggested to Zhao that he maintain distance with Deng Xiaoping [and] attempt to win the people's hearts in order to save himself; there were no other options." Because Zhao was never formally charged with any wrongdoing, it cannot be known what evidence Li had to support his claims. Zhao himself addressed Li's claims as "slander". Zhao remained under tight supervision and was allowed to leave his courtyard compound or receive visitors only with permission from the highest echelons of the Party. There were occasional reports of him attending the funeral of a dead comrade, visiting other parts of China or playing golf at Beijing courses, but the government rather successfully kept him hidden from news reports and history books. Over that period, only a few snapshots of a gray-haired Zhao leaked out to the media. On at least two occasions Zhao wrote letters, addressed to the Chinese government, in which he put forward the case for a reassessment of the Tiananmen Massacre. One of those letters appeared on the eve of the Communist Party's 15th National Congress. The other came during a 1998 visit to China by U.S. President Bill Clinton. Neither was ever published in mainland China. After 1989, Zhao remained ideologically estranged from the Chinese government. He remained popular among those who believed that the government was wrong in ordering the Tiananmen Massacre, and that the Party should reassess its position on the student protests. He continued to hold China's top leadership responsible for the assault, and refused to accept the official Party line that the demonstrations had been a part of a "counter-revolutionary rebellion". After his arrest, Zhao eventually came to hold a number of beliefs that were much more radical than any positions he had ever expressed while in power. Zhao came to believe that China should adopt a free press, freedom to organize, an independent judiciary, and a multiparty parliamentary democracy. Zhao lived for fifteen years under house arrest, accompanied by his wife. The hutong in which Zhao lived had once belonged to a hairdresser of the Qing Dynasty Empress Dowager, Cixi. Before his death in 1987 Hu Yaobang had also lived in the house. It was supplied by the Beijing government and is located in central Beijing, close to Zhongnanhai. Despite Zhao's house arrest, no formal charges were ever laid against him, and he was never expelled from the Communist Party. After his arrest, Deng and his successors continued to believe that Zhao and his subordinates had worked secretly to organize the nationwide protests, and worried that his death might trigger protests similar to the protests sparked by the death of Hu Yaobang. In February 2004, Zhao had a pneumonia attack that led to a pulmonary failure and was hospitalized for three weeks. Zhao was hospitalized again with pneumonia on 5 December 2004. Reports of his death were officially denied in early January 2005. Later, on 15 January, he was reported to be in a coma after multiple strokes. According to Xinhua, Vice President Zeng Qinghong represented the party's central leadership to visit Zhao at the hospital. Zhao died on 17 January in a Beijing hospital at 07:01, at the age of 85. He was survived by his second wife, Liang Boqi, and five children (a daughter and four sons). After Zhao's death, China's leaders feared an episode of civil disturbance similar to that which followed the death of Hu Yaobang. In order to manage the news of Zhao's death, the Chinese government created an "Emergency Response Leadership Small Group", which declared "a period of extreme sensitivity", and placed the People's Armed Police on special alert. In order to prevent any mass demonstrations in the capital, the Emergency Group directed the Ministry of Railways to screen travellers headed to Beijing. In order to prevent any public commemoration of Zhao, Chinese authorities increased security in Tiananmen Square and at Zhao's house. Xinhua successfully directed China's domestic TV and radio stations not to broadcast the news. The very few that were granted permission to report the story were told to refer to him only as "comrade" without mentioning his past leadership posts. Under the headline "Comrade Zhao Ziyang has Passed Away", Zhao's obituary stated, "Comrade Zhao had long suffered from multiple diseases affecting his respiratory and cardiovascular systems, and had been hospitalized for medical treatment several times. His conditions worsened recently, and he passed away Monday after failing to respond to all emergency treatment." All Chinese newspapers carried exactly the same 59-word obituary on the day following his death, leaving the main means of mass dissemination through the Internet. Chinese Internet forums, including the Strong Nation Forum and forums hosted by SINA.com, Xinhua, and the People's Daily, were flooded with messages expressing condolences for Zhao: "Time will vindicate him", wrote one commenter; "We will miss you forever" wrote another. These messages were promptly deleted by moderators, leading to more postings attacking the moderators for deleting the postings. 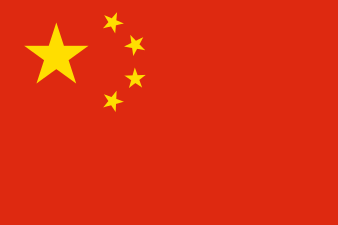 The Chinese government was successful in keeping Zhao's death fairly low key within mainland China. Open, public response was absent, though some online commenters stated that they planned to buy wreaths to mourn his death, or had stood in three minutes of silence to honour Zhao's memory. In Hong Kong, 10,000–15,000 people attended the candlelight vigil in remembrance of Zhao. Mainlanders such as Chen Juoyi said that it was illegal for Hong Kong legislators to join any farewell ceremony, stating "...under the 'one country, two systems' a Hong Kong legislator cannot care anything about mainland China." The statement caused a political storm in Hong Kong that continued for three days after his speech. Szeto Wah, the chairman of The Hong Kong Alliance in Support of Patriotic Democratic Movements in China, said that it was not right for the Communists to suppress the memorial ceremony. The twenty-four pan-democrat legislators went against the President of the Legislative Council of Hong Kong Rita Fan, who insisted that security be tightened at Tiananmen Square and at Zhao's house, and that the authorities try to prevent any public displays of grief. Similar memorials were held around the world, notably in New York City and Washington, DC where American government officials and exiled political dissidents attended. In the West, Zhao was editorialized as a martyr who died for democracy. On 29 January 2005 the government held a funeral ceremony for him at the Babaoshan Revolutionary Cemetery, a place reserved for revolutionary heroes and high government officials, that was attended by some 2,000 mourners, who were pre-approved to attend. Several dissidents, including Zhao's secretary Bao Tong and Tiananmen Mothers leader Ding Zilin, were kept under house arrest and therefore could not attend. Xinhua reported that the most senior official to attend the funeral was Jia Qinglin, fourth in the party hierarchy, and other officials who attended included He Guoqiang, Wang Gang and Hua Jianmin. Mourners were forbidden to bring flowers or to inscribe their own messages on the government-issued flowers. There was no eulogy at the ceremony because the government and Zhao's family could not agree on its content: while the government wanted to say he made mistakes, his family refused to accept he did anything wrong. On the day of his funeral, state television mentioned Zhao's death for the first time. Xinhua issued a short article on the funerary arrangements, acknowledging Zhao's "contributions to the party and to the people", but said he made "serious mistakes" during the 1989 "political disturbance". According to Du Daozheng, who wrote the foreword to the Chinese edition of Zhao's memoirs, the use of the term "serious mistakes" instead of the former verdict of supporting a "counter-revolutionary riot" represented a backing down by the Party. After the ceremony, Zhao was cremated. His ashes were taken by his family to his Beijing home, since the government had denied him a place at Babaoshan. After Zhao's death, there were a number of calls in China and abroad urging China to reconsider Zhao's role in history. Within China, these calls were largely led by Zhao's former secretary, Bao Tong. Outside of China, Zhao's death produced calls from the governments of Taiwan and Japan urging China to move toward granting the greater political freedoms that Zhao promoted. The Japanese prime minister, Junichiro Koizumi, said as part of a statement on Zhao's death: "I want them to make efforts for democratization". A representative of the Taiwanese cabinet, Chen Chi-mai, stated that Beijing should "face the truth about Tiananmen Square" and "push for democratic reforms". The White House praised Zhao, saying that Zhao "was a man of moral courage who suffered great personal sacrifices for standing by his convictions during difficult times." Although some of his followers have occasionally attempted to push for Zhao's formal rehabilitation since Zhao's arrest, the Party has been largely successful in removing his name from most public records available in China. Government efforts to delete Zhao's memory from public consciousness include airbrushing his picture from photographs released in China, deleting his name from textbooks, and forbidding the media from mentioning him in any way. In 2005, former NPC chairman Wan Li joined more than 20 retired Politburo members, including Tian Jiyun, former Vice Premier, in asking the Central Government to rehabilitate Zhao's name and hold memorial services for him for his many important contributions to China. The Chinese government agreed to hold a ceremony to honor the late Communist Party chief Zhao Ziyang, but the response fell far short of satisfying the requests from both inside and outside the CPC. Since 1989, one of the few publications that has dared to print a non-government-approved memorial praising Zhao's legacy has been the magazine China Through the Ages (Yanhuang Chunqiu). The magazine released the pro-Zhao article in July 2010. The article was written by Zhao's former aide, Yang Rudai. On 14 May 2009, a published edition of Zhao's memoirs was released to the public, under the English title Prisoner of the State: The Secret Journal of Premier Zhao Ziyang. The 306-page book was crafted over four years from tapes recorded in secret by Zhao, who lived under tightly monitored house arrest for 15 years before dying in 2005. In the last chapter, Zhao praises the Western system of parliamentary democracy and says it is the only way China can solve its problems of corruption and a growing gap between the rich and poor. Zhao's published autobiography is based on approximately thirty cassette tapes which Zhao secretly recorded between 1999 and 2000. The material in his biography was largely consistent with the information from the "Tiananmen Papers", an unauthorized collection of Chinese government documents published in 2001. The book was also consistent with material from "Captive Conversations", a record of conversations between Zhao and his friend Zong Fengming, which was published only in Chinese. According to Zhao's friend and former coworker, Du Daozheng, Zhao only recorded the tapes after being convinced by his friends to do so. Prisoner of the State contained minor historical errors, which commenters noted may reflect how out of touch China's leaders are with Chinese society. Although the Beijing populace did spontaneously attempt to block Chinese troops' entrance into Beijing, Zhao's assertion that "groups of old ladies and children slept in the roads" was not correct. Zhao noted that the astrophysicist Fang Lizhi (the Chinese government's most wanted dissident following the Tiananmen Protests) was out of the country in 1989 and publicly critical of Deng Xiaoping, when in fact Fang was living just outside Beijing and deliberately kept silent about politics during the 1989 protests. As of 2009 his memoir was being sold (in both Chinese and English) in Hong Kong but not in mainland China, though a Microsoft Word document containing the memoir's entire Chinese-language text became available on the Internet and was downloaded widely throughout mainland China. The recordings highlighted Zhao's heavy Henan accent, making his Mandarin at times hard to follow. ↑ 武汉市第十四中学校友赵紫阳 Archived 12 May 2015 at the Wayback Machine. ↑ 趙蔚 (1989). "第一章 故鄉、家世和童年". 《趙紫陽傳》. 中國新聞出版社. pp. 4–12. ↑ "Archived copy". Archived from the original on 3 January 2009. Retrieved 26 January 2009. 1 2 3 4 5 6 7 8 9 10 11 12 13 14 15 16 Becker, Jasper. "Zhao Ziyang: Chinese Leader Who 'Came too Late' to Tiananmen Square". The Independent. 18 January 2005. Retrieved 18 September 2011. 1 2 3 4 5 6 7 8 9 10 11 12 13 NewropMag. "China: Zhao Ziyang has died!" Newrop Mag. 25 January 2005. Retrieved 10 September 2011. 1 2 3 4 5 6 "Zhao Ziyang". The New York Times. 25 January 2005. Retrieved 15 September 2011. 1 2 Ignatius, Adi. "Preface". In Zhao Ziyang. Prisoner of the State: The Secret Journal of Zhao Ziyang. New York, NY: Simon and Schuster. 2009. ISBN 1-4391-4938-0. p.xii. 1 2 3 4 Ignatius, Adi. "Preface". In Zhao Ziyang. Prisoner of the State: The Secret Journal of Zhao Ziyang. New York, NY: Simon and Schuster. 2009. ISBN 1-4391-4938-0. p.xiii. ↑ Bramall, Chris. "Origins of the Agricultural 'Miracle': Some Evidence from Sichuan". The China Quarterly. No. 143, September 1995. p. 733. Retrieved 10 September 2011. 1 2 3 4 5 "Obituary: Zhao Ziyang". BBC News. 17 January 2005. Retrieved 15 September 2011. ↑ Fulford, Robert. "There's no Right to Know in China". The National Post. 22 January 2005. Retrieved 20 September 2011. ↑ Santolan, Joseph. "Social inequality and the Yangtze River drought". World Socialist Web Site. 18 May 2011. Retrieved 20 September 2011. ↑ Yardley, Jim. "Zhao Ziyang, Chinese Leader Purged for Supporting Tiananmen Protesters, Dies at 85". The New York Times. 17 January 2005. Retrieved 16 September 2005. p.2. ↑ Forney, Matthew, and Jakes, Susan. "The Prisoner of Conscience: Zhao Ziyang, 1919–2005". TIME World. 16 January 2005. Retrieved 15 September 2011. ↑ "赵紫阳之后的中国". Open Magazine. Retrieved 3 November 2012. ↑ "股份制改革是市场行为吗？". Financial Times. Retrieved 9 November 2012. 1 2 MacFarquhar, Roderick. "Foreword". In Zhao Ziyang, Prisoner of the State: The Secret Journal of Premier Zhao Ziyang. New York, NY: Simon and Schuster. 2009. ISBN 1-4391-4938-0. p. xix. ↑ MacFarquhar, Roderick. "Foreword". In Zhao Ziyang, Prisoner of the State: The Secret Journal of Premier Zhao Ziyang. New York, NY: Simon and Schuster. 2009. ISBN 1-4391-4938-0. pp. xviii–xix. ↑ Wang Hui. China's New Order: Society, Politics, and Economy in Transition. Ed. Huters, Theodore. Cambridge, MA: Harvard Press, 2003. ISBN 0-674-02111-8. pp.56–57. 1 2 3 Pomfret, John. "In Posthumous Memoir, China's Zhao Ziyang Details Tiananmen Debate, Faults Party". Washington Post. May 15, 2009. p.2. 1 2 Pan, Philip P. "Chapter One: The Public Funeral" in Out of Mao's Shadow: The Struggle for the Soul of a New China. ↑ Wu Guoguang. "The Sacrifice That Made a Leader" Archived 2 April 2012 at the Wayback Machine.. TIME Magazine. 17 January 2005 (Vol.165, No.3). Retrieved 20 September 2011. 1 2 3 4 Link, Perry. "Book Review: 'Prisoner of the State: The Secret Journal of Zhao Ziyang'". The Washington Post. 17 May 2009. Retrieved 20 September 2011. ↑ Garnaut, John. "Twenty Years on - Legacy of a Massacre". The Age. May 30, 2009. 1 2 3 "Chinese Media Muted on Zhao Death". BBC News. 18 January 2005. Retrieved 15 September 2011. 1 2 3 "Online Tributes to Zhao Ziyang". BBC News. 17 January 2005. Retrieved 15 September 2011. ↑ Spence, Jonathan (26 January 2005). "Martyr Complex". The New York Times. ↑ Wu Nan. "Babaoshan Struggles to Meet Demand as Cadres' Final Resting Place". South China Morning Post. September 23, 2013. ↑ Kahn, Joseph. "China Gives Zhao's Death Scant Notice". The New York Times. 18 January 2005. Retrieved 18 January 2005. ↑ Reuters and The Chicago Tribune. "Mourners pay respects to ousted Chinese leader" Archived 7 January 2009 at the Wayback Machine.. The Seattle Times. 19 January 2005. Retrieved 20 September 2011. ↑ Pan, Philip P. "Chapter One: The Public Funeral" Archived 15 July 2011 at the Wayback Machine.. Out of Mao's Shadow: The Struggle for the Soul of a New China. 2008. Retrieved 20 September 2011. ↑ Reuters. "China Magazine Praises Ousted Zhao in Test of Taboo". China Digital Times. 2010. Retrieved 15 September 2011. ↑ Fenby, Jonathan (2009). The Penguin History of Modern China: The Fall and Rise of a Great Power, 1850 -2009. Penguin Books. ISBN 0-7139-9832-6. ↑ The Tiananmen Diaries, Perry Link, Washington Post, 17 May 2009. ↑ Ching, Frank (9 August 2010). "Another tongue that's not so common after all". SCMP. Hong Kong. "Zhao Ziyang collected news and commentary". The New York Times.